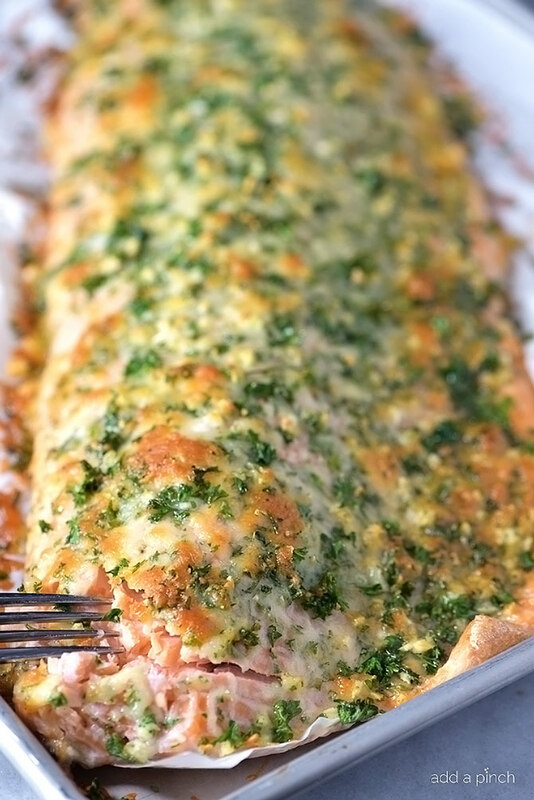 Baked salmon makes a weeknight meal that is easy enough for the busiest of nights while being elegant enough for entertaining. 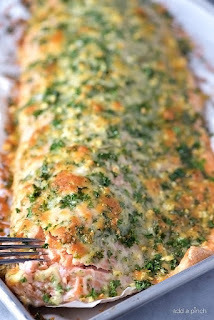 This oven baked salmon with a Parmesan herb crust is out of this world delicious! ~ Preheat oven to 425º F. Line rimmed baking sheet with parchment paper or aluminum foil for easiest cleanup. ~ Place salmon, skin side down, onto lined baking sheet. Cover salmon with another piece of parchment paper. Bake salmon for 10 minutes. Remove from oven and remove top piece of parchment paper. Top with garlic, Parmesan and parsley mixture. Return to oven uncovered and allow to bake until registers 135º F when checked with an internal thermometer probe. The Parmesan cheese should have melted and lightly browned..
~ Allow to rest about 5 minutes and serve.